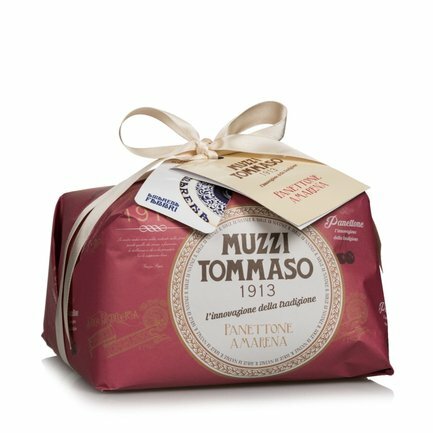 When the classic Tommaso Muzzi panettone is combined with delicious Fabbri amarena cherries, something particularly special is created. The sweet, succulent cherries enveloped by the soft, fragrant mixture give this panettone a superb flavour and style. Serve it as a dessert with some good vanilla ice cream: your guests are sure to be impressed! Ingredients Wheat flour, candied cherries 22% (black cherries, sugar, glucose syrup, water, acids: citric acid, black cherry juice concentrate, natural colouring: anthocyanins, flavourings), butter, eggs, sugar, egg yolk, milk, natural yeast (wheat), emulsifiers: mono and diglycerides of fatty acids, flavourings, cocoa butter, salt. May contain nuts and soy. Can contain kernels or kernel fragments. For more information on product labels, please contact our Customer Service department. The information on the labels of the products may vary for reasons beyond our control, therefore, there may be discrepancies between the information on the site and that on the products delivered. Please always check the information on the product before consumption or use.